Alan W. Farley, "Samuel Hallett and the Union Pacific Railway Company in Kansas," p. 1. John E. Sunder, "Telegraph Beginnings in Kansas," p. 32. James C. Malin, "William Sutton White, Swedenborgian Publicist: Part Two, Kansas Exemplar of the Philosophy of Emanuel Swedenborg and Herbert Spencer," p. 63. 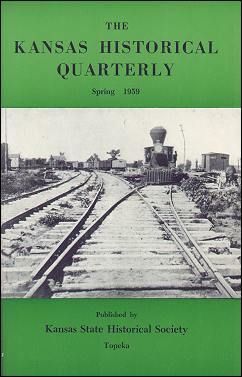 The Annual Meeting, p. .
Bypaths of Kansas History, p. .
Kansas History as Published in the Press, p. .
Kansas Historical Notes, p. .
"The Union Pacific railroad yard at Wyandotte in 1867, photo by Alexander Gardner. This and the two which follow are from a collection of 150 photographs which Gardner took along the line of the Kansas Union Pacific to its end of track, '20 miles west of Hays,' in 1867." 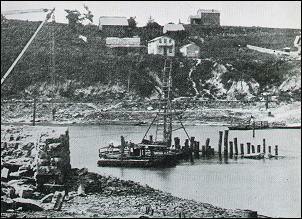 Upper: Building a bridge across the Kaw at Wyandotte. 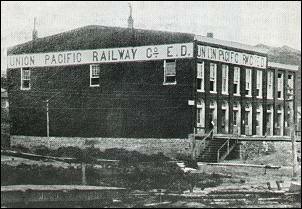 Lower: Office, Union Pacific Railway Co., E. D., at Wyandotte.